122 pages | 4 B/W Illus. 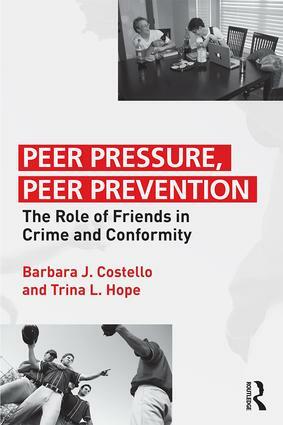 Criminological research has largely neglected the possibility that positive peer influence is a potentially powerful source of social control. Quantitative methods tease out cause, effect, and spuriousness in the relationship between peer delinquency and personal delinquency, but these methods do little or nothing to reveal　how and why　peers might influence each other toward--or away from--deviance. Costello and Hope take a first step toward uncovering the mechanisms of peer influence, drawing on quantitative and qualitative data collected from two convenience samples of university students. Their quantitative analyses showed that positive peer influence occurs most frequently among those who associate with the most deviant peers and self-report the most deviance, contrary to predictions drawn from social learning theories. Their qualitative data revealed a variety of methods of negative influence, including encouraging deviant behavior for others' amusement, a motive for peer influence never before reported in the literature. "This is an original effort to calm long-standing squabbles among criminologists about the place of peers in explanations of deviant acts. Costello and Hope see that these disputes—fueled by deductive theory and statistical analyses—may be resolved by quietly questioning people performing and reacting to the acts in question. Their findings justify their effort. All is not as we have been led to believe. The several claimants to this disputed territory—whether strain, control, or learning theorists—will find good reasons to rethink their claims. Need I note that such progress is rare?" -Travis Hirschi, Emeritus Professor of Sociology, University of Arizona. "This book makes a major contribution by considering how peer pressure goes in multiple directions. It broadens our discussion of peer effects on crime and thus can help resolve many of the issues that have been discussed for many decades." "Criminologists know little more about mechanisms of peer influence or the everyday social interaction of youth than they did a generation ago. This is a sad and startling admission, particularly in light of all the attention that peer influence has received in recent years. This book brings the authority and richness of real life back into the study of peer influence, along with an abundance of original insights and ideas. For an area often hindered by methodological controversies and theoretical inertia, this should be welcome news. Costello and Hope deserve our thanks." Barbara J. Costello (Ph.D., University of Arizona) is Associate Professor of Sociology at the University of Rhode Island. Her research has focused on testing and extending control theories of crime and delinquency, and on the explanation of both positive and negative peer influence. Trina L. Hope (Ph.D., University of Arizona) is Associate Professor of Sociology at the University of Oklahoma. Her research has focused primary on criminological theory-testing, including applying concepts from control theories to gang membership, gang and dating violence, adolescent sexual activity, pregnancy resolution, and substance use.